Run, don’t walk to the seafood market. You will benefit from the physical activity AND the omega 3 fatty acids. A recent study in the British Medical Journal reminds us once again of the need for fish in our diet. Inflammation is the root of many of our health issues. In fact, seven of the leading causes of death are due to chronic inflammation. 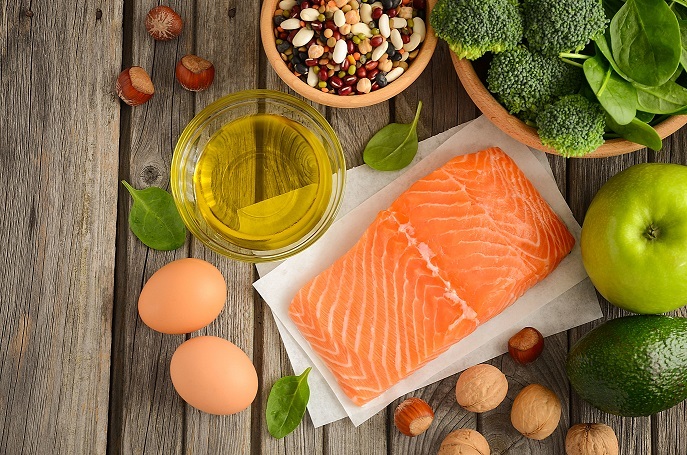 Eating more fish, especially fatty fish such as salmon, trout, tuna, and mackerel, can help reduce inflammation. For more information about eating more fish, click here: Steps to Eating the Med Way: Change Your Protein. Heat 1-2 Tablespoons of olive or canola oil in a saucepan (it is better to use a regular pan as opposed to nonstick as they get hotter and allow you to get a good sear). Place the salmon skin side up in the pan. You want to cook the side that will be facing up on the plate first. Cook for about 4 minutes depending on thickness. The salmon will release from the pan when it is seared. Flip and cook for a few more minutes until desired doneness. Serve with a salad or roasted vegetables. For more salmon recipes, please click here: Salmon Recipes.